You can now trade stocks for free. 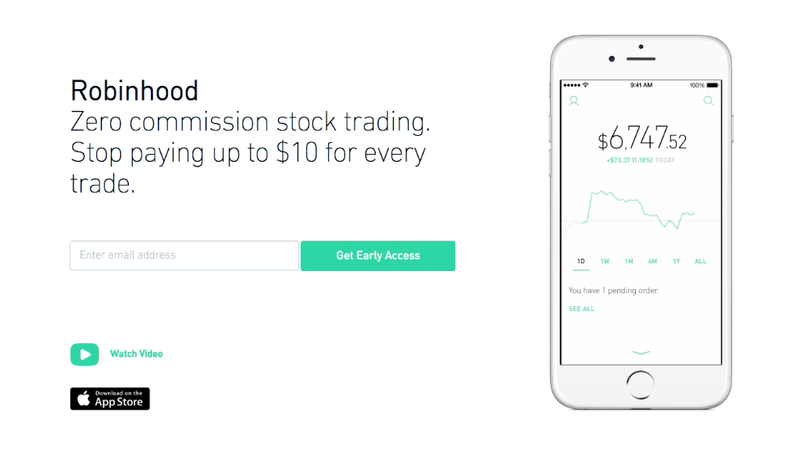 As implausible as that sounds, the new Robinhood app allows you to trade stocks for no commission. That's a fat discount to the $7.99 or more that other online brokers such as E*Trade (ETFC) charge when you buy and sell stocks. The app officially launched Thursday after having amassed a list of 800,000 people on a waitlist. It can be dowloaded for free on the iPhone (an Android version is in the works). Besides offering free trading, the app also doesn't require a minimum balance to open an account. So someone could put in as little as $50 to $100 and start trading. The goal was to attract millennials and so far, the target audience is responding. The average age of a Robinhood account holder is 26, the company told CNNMoney. The millennial way: Robinhood cofounders Vladimir Tenev and Baiju Bhatt are math nerds who were roommates at Stanford University. As is typical of dot.com founders, they wear hoodies to work instead of suits and post Instagram selfies of themselves holding cats and solving math problems on the company website. While they are based in Silicon Valley now, both got their start on Wall Street building high speed trading programs. "I think a lot of people that use Robinhood grew up in an era where Wall Street blew up in 2008," said Bhatt. "They kind of see Wall Street and a lot of big banks as not very trustworthy." They're certainly right about that -- Nearly 60% of millennials say they distrust financial markets, according to a recent survey Capital One ShareBuilder. A similar analysis by State Street's Center for Applied Research found that millennials are holding an incredibly high portion of their portfolios -- 40% -- in cash because of fears about the markets. "We see people investing about $100 a week on average and that just kind of speaks to how this product is unlocking the market for the micro investor," Bhatt says. How to make money: Some have raised questions about Robinhood's business model since they don't charge fees. The founders say it makes money the same way most other brokerages do: by margin lending and earning interest on people's cash balances. Their goal is more to be the "go to" trading platform for young people. "We think that if we can get people to start [investing] when they're in their late teens or early 20's, that's gonna pay tremendously down the road," Tenev says. For now, the company is backed by prominent venture capital firms including Google Ventures and Andreessen Horowitz as well as celebrities Jared Leto and Snoop Dogg.